Sorry for the hiatus guys – it’s been a long two weeks! Anyway, where was I? Oh yes, waistcoats. We worked on them for three days. Ta-dah!! So once the waistcoats were (sort-of) finished, we officially switched gears to our 19th century bustle gown project, starting with the corset. 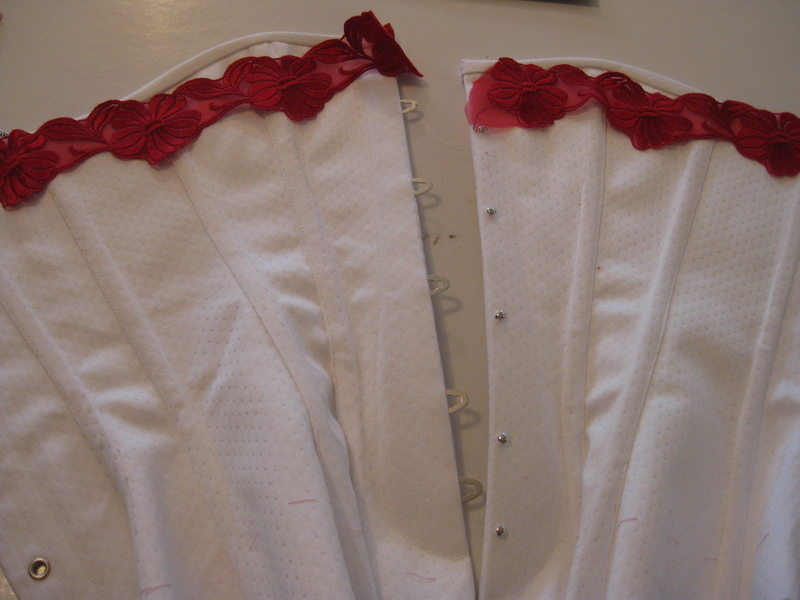 Corsets are satisfyingly speedy to make. Ta-dah!! And guess what? It’s FINISHED!!!!!! My first COMPLETED garment of the course!! Well, except for the buckle that needs stitching on the waistband. Two minute job, if that. The bustle cage was also nice and quick to make, only about two days overall (including the time I stayed late). Filing down the sharp edges of the steel boning was the most time-consuming bit, and then wrestling the boning into the criss-crossing top section was the most awkward. Apart from that, easy-peasy! I finished the cage by 2 pm last Friday, so then it was back to my corset (the spoon busk had arrived by then). Tell you what, topstitching around the curved edge of a spoon busk is nerve-wracking. In fact, as a rule, I have to remind myself to breathe when I’m topstitching anything. But the busks went in without any major incident, and by the end of the day I had the top of one side bias bound. I decided to be brave and go for the “stitch in the ditch” method rather than attempt to slip-stitch some of the sturdiest coutil I’ve ever come across, and since then I’ve gotten the bias binding on the top of the other side as well. I think it’s fair to say I have gotten nice and comfortable with stitch in the ditch! Here it is with lace I’m thinking of using for some added decoration, but I’m not entirely sure I like it (the lace, I mean). Thoughts? All I’ve got to do now to finish it is shorten the bones, get them in, and get the bottom edges bound. I say “all” like it’s not going to take an entire afternoon shortening every single bone (the shortest ones Pauline has are 1/4″ too long. Bah). But still, it’s certainly coming along! 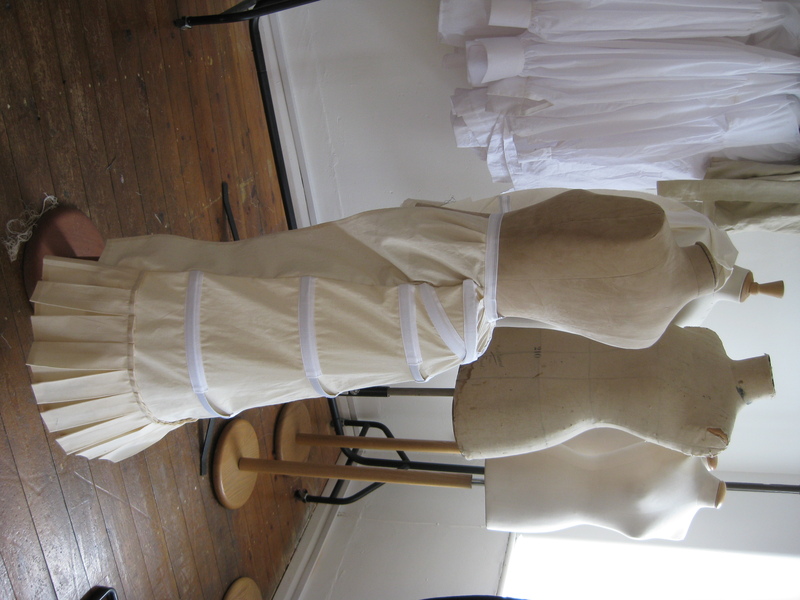 And THEN, on Monday of week 7, we started petticoats. It was a fraught week, mostly because of pleats. F*!%ing pleats. 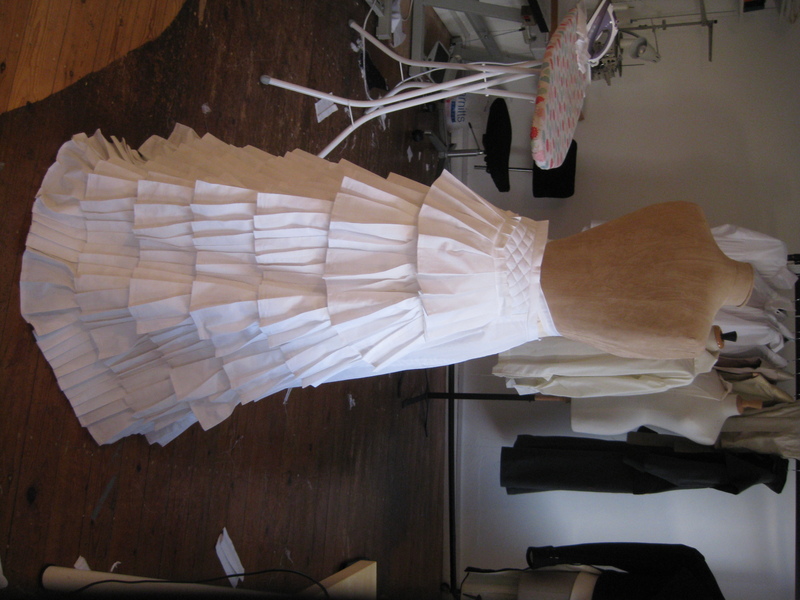 We had the option to make ruffles either with gathers or with knife pleats. I thought well, I’ve already got a waterfall petticoat with gathered ruffles, and I absolutely hated doing it at the time. Pleats are nice, especially knife pleats, those are simple – yes, I’ll make mine with knife pleats! I quickly came to regret this decision. I had arrived at the college at 8.50 Tuesday morning, and didn’t leave until 8.50 that night. What’s more, I took some prepped strips away with me so I could pleat on the train. Pleating on the train, after a 12-hour day. Turns out it’s nauseating work. It was a bleak time. And now we’re nearly caught up, blog-wise. 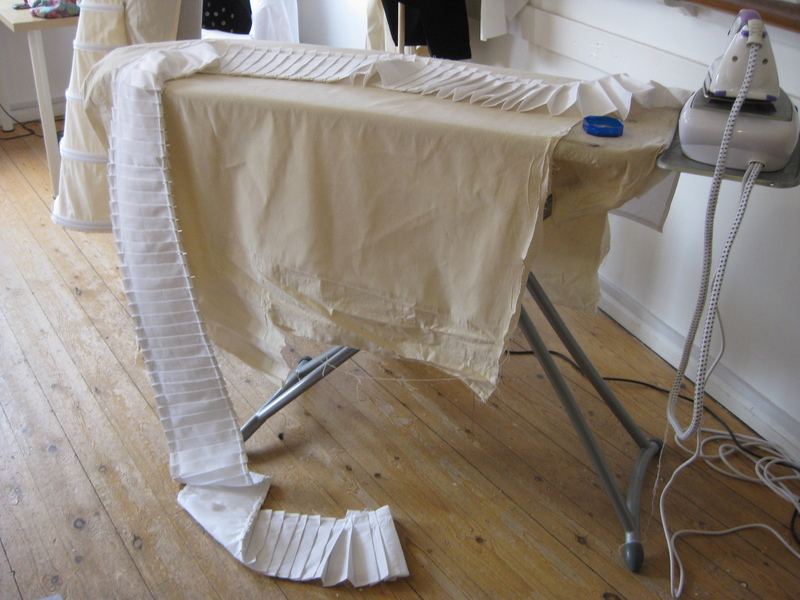 Thursday this week we made our combinations (combined chemise and drawers in one garment, proper period undies! 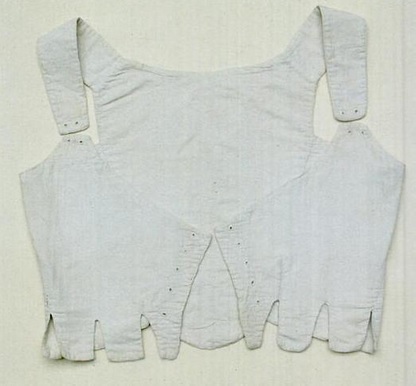 ), which was more faffing around with polycotton and corners and gathering (almost like the shirt, but less heinous). 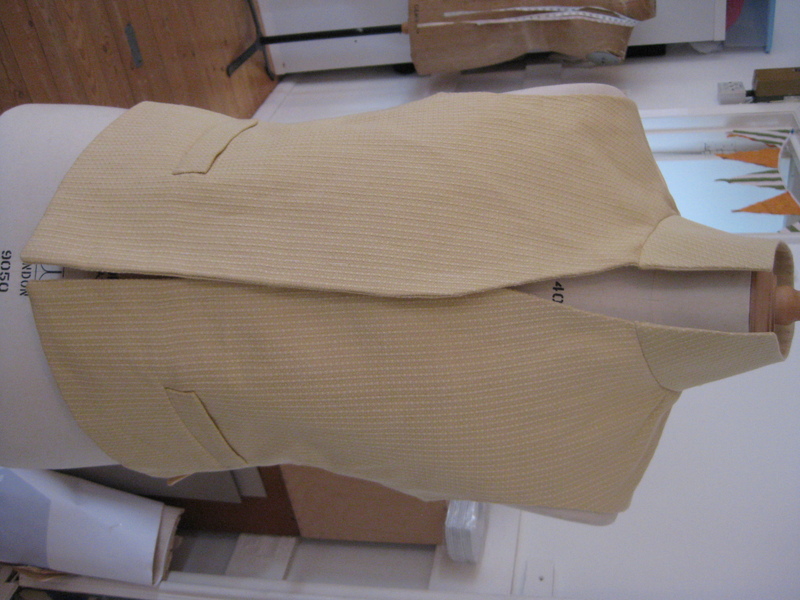 And then yesterday, finally, I SEWED THE SLEEVES INTO MY JACKET. My unfinished jacket and breeches had been looming in the back of my mind for the past two weeks, and it felt SO GOOD to get the damn sleeves on!! I had previously spent a few hours trying, and failing, to get the sleeves pinned in right. Ultimately Pauline spent 35 minutes first thing Friday morning pinning my sleeves in for me herself!! I know that kind of defeats the point, but oh well, I’ll give setting sleeves another go on the bustle gown. No pictures from Friday yet, but I can happily say that the sleeves are stitched on, the collar is finished (needs a good press though – I am kicking myself for not having taken the two minutes to cut out a top layer for the collar that would have fit on properly rather than wrenching it into place so now it sits kind of funny on one side but here’s hoping it’s nothing a good press won’t fix! 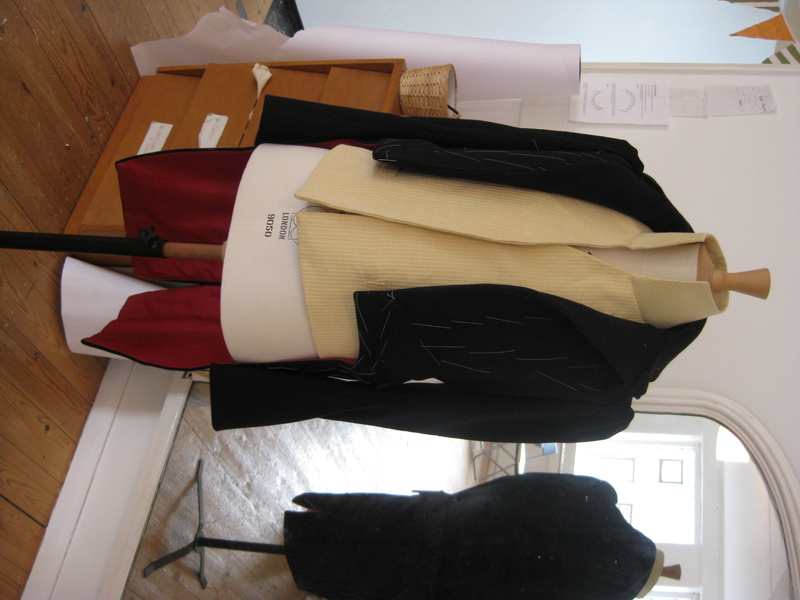 ), and my breeches are all sewn up and wearable. Huzzah! So that’s it, we’re halfway through. Next week is the week off, but I’m going in on Monday and Tuesday to catch up on a few more things. I have to 1) hand sew the sleeve lining of the jacket; 2) put facing around the cuffs of my breeches; 3) finish my corset and 4) about a dozen other small odds and ends but those first three are the main things. I’ll try to be better about posting regularly in future. Thanks for reading!